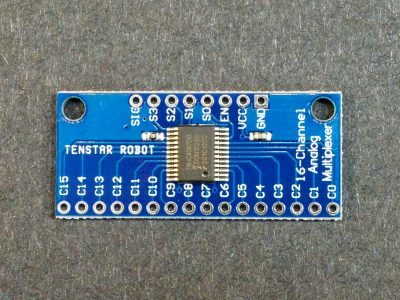 The DS3231 RTC with EEPROM Module is based on the very capable DS3231 Real Time Clock/Calendar chips which has been around for awhile and has excellent library support. The chip includes a built-in 32kHz crystal oscillator which is temperature compensated. The temperature reading from the RTC is made available via the I2C bus. This reading is not terribly accurate and is spec’d at ± 3C, though it has been within ± 2C or better in our testing. The module brings out the 32kHz square wave timing signal that the RTC clock runs on. The output of the chip is open-collector and the module includes a 4.7K pull-up resistor on this line. This clock output may be useful in some applications to either measure the accuracy of the clock timing or to clock other circuits. 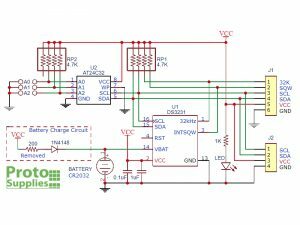 The chip has aging offset registers which allow for adding/subtracting capacitance to slow or speed up the clock if it is desired to optimize the accuracy. The pin marked SQW which stands for Square Wave is a dual purpose output. It can carry either a square wave which can be programmed to one of a couple frequencies or it can be used as an interrupt output for the built-in time-of-day alarms. This pin is also an open-collector output and the module includes a 4.7K pull-up resistor on this line as well. The programmable square wave output is limited to frequencies of 1Hz, 1.024kHz, 4.096kHz and 8.192kHz. 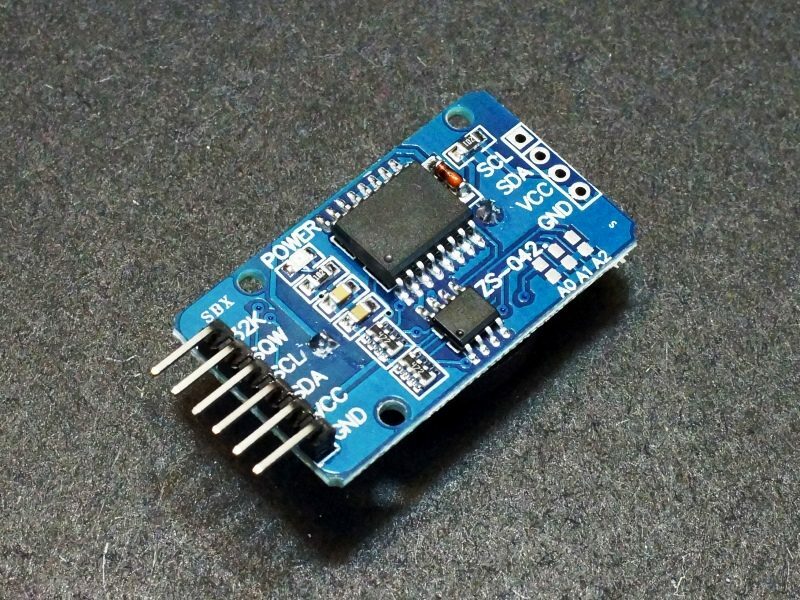 Communications with the DS3231 chip is via I2C and it has a fixed address of 0x68. The module also includes a separate AT24C32 EEPROM which provides 4K x 8-bits of non-volatile memory. 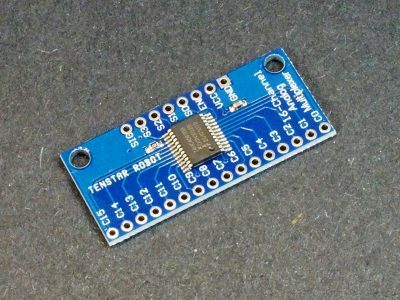 This chip hasn’t nothing to do with the RTC directly, but it can be handy for applications such as data logging which is based on time or can be used for storage of any other data that you want to be non-volatile. 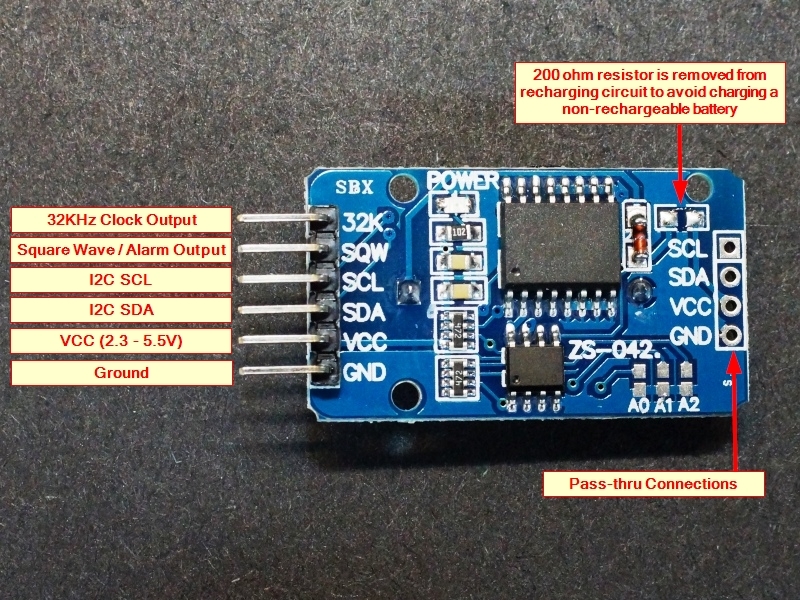 This memory is non-volatile by its design and is independent of the battery that is on the module. When writing/reading the EEPROM, keep in mind that different data types occupy different amounts of memory. For instance Char is 1 byte, Integers are 2 byes and Floats are 4 bytes each. The EEPROM is rated for a minimum of 1,000,000 write cycles, so there is little concern about wearing out the EEPROM during normal data logging type applications as long as you are not doing something like writing data every second. The EEPROM also communicates via I2C at the address of 0x57. The module includes jumpers on the 3 address lines (A0-A2) to the EEPROM which potentially allows for having multiple EEPROMs with different addresses in the same system or the address can be changed in case of a conflict with another device. These lines are pulled up to VCC via 4.7K pull-up resistors on the module and a solder short across these pads will ground them and change the address. The possible range of addresses is 0x50 – 0x57. The module has an easy to use I2C interface which occupies two addresses. The DS3231 RTC chip is at address 0x68 and the EEPROM is at 0x57. The I2C lines have 4.7K pull-up resistors which are part of the small resistor packs. 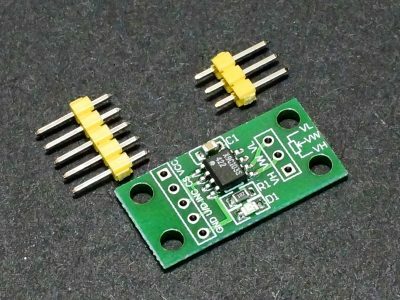 The I2C SDA and SCL signals are also brought out to solder pads along with power and ground on the top of the module to allow for looping these signals out to another module if desired. The board has a 6-pin right-angle male header. 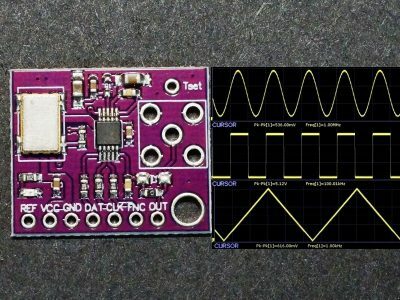 The module also brings the VCC, GND, SCL and SDA lines out to solder pads on top of the module which can be used to loop these signals through to another module if desired. These are nice modules with very good timing accuracy. 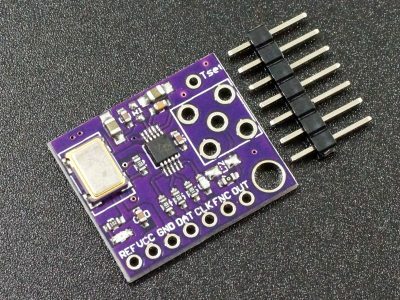 The EEPROM is also quite handy, especially for non-volatile data collection that allows you to upload the data to a computer at some point in the future. The battery that comes with the module are already installed and running, so remaining lifespan is unknown. Since these are fairly inexpensive batteries to begin with, if you are putting this module into full-time operation in an application, you may want to swap this battery out for one with a known pedigree. Important Note: These modules normally come with a 200 ohm resistor installed in the location next to the glass diode which can be seen in some of the pictures. 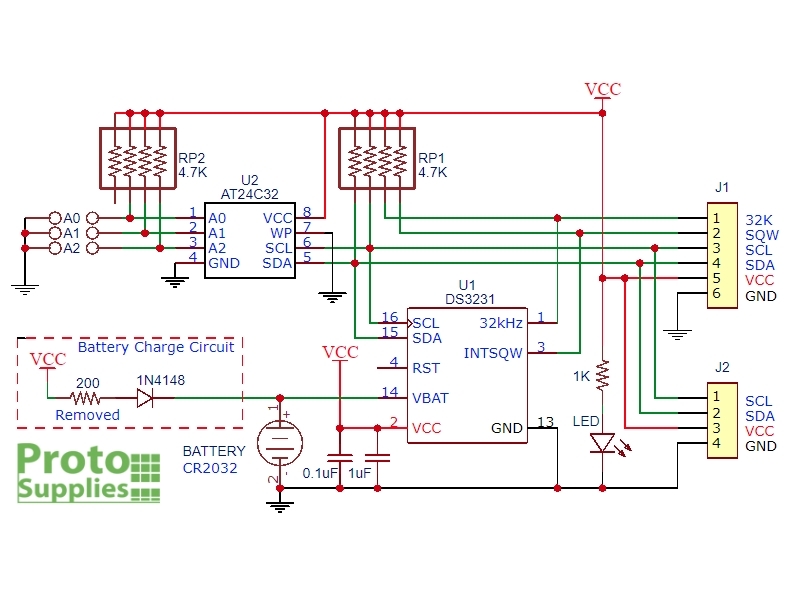 The resistor and diode form a simple charging circuit that is intended for use with LIR2032 rechargeable batteries. Since the module ships with a non-rechargable CR2032 battery, this resistor is removed since recharging it could cause failure of the battery. The resistor is taped to the back of the battery in case you want to reinstall it for use with a rechargeable LIR2032 battery or you can toss it. 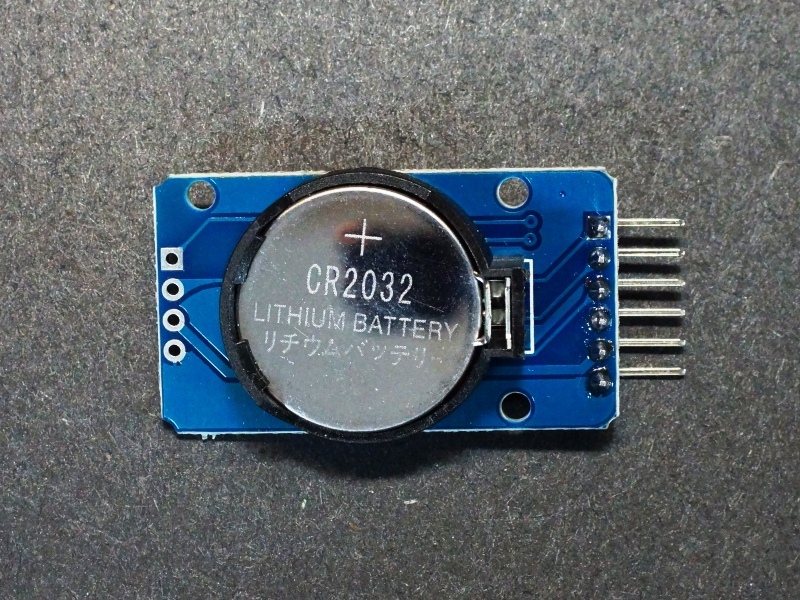 If you do decide to use a rechargeable battery and add this resistor back in, please note that this circuit does not guarantee that the specified 4.2V charging voltage will be applied to the LIR2032 battery, so there is some chance of overcharging and destroying that battery as well. We recommend either staying with the CR2032 type non-rechargeable battery or do some research and possibly make some circuit modifications if necessary to ensure that the charging voltage is correct for the LIR2032 that you use. The schematic shows the resistor that is removed and the circuitry should you decide to modify it. The program below illustrates the main functions of the module including setting the date/time and reading it back out, writing and reading the EEPROM memory and reading the built in temperature sensor of the DS3231. 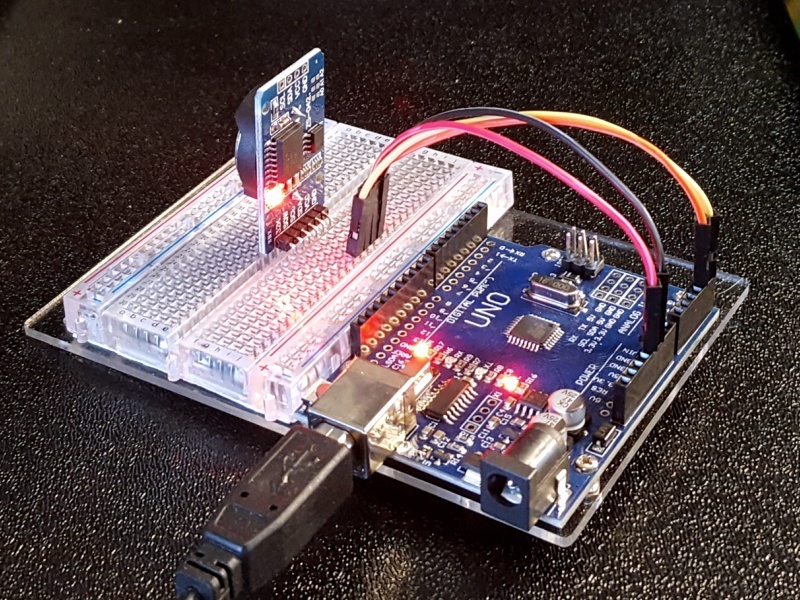 We are using the uRTCLIB library downloadable from the Arduino IDE, because it includes EEPROM support and is nice and small, but there are many libraries to choose from if another one suits your purposes better. This library does not support the time-of-day alarms or programming the SQW output. If you need to set the date/time, uncomment the rtc.set(0, 39, 13, 6, 19, 10, 18); and enter the current values. Download the program and then comment this line back out so that you don’t accidentally overwrite the time again. Setting the exact time down to the second can be difficult since it depends on the compile and download time but you can usually get within a couple of seconds. 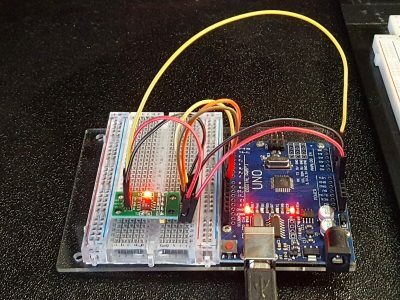 The rest of the program does a few different things to illustrate the use of the RTC and EEPROM memory and sends the output to the Serial Monitor Window. The program first does a couple of write and reads to the EEPROM of several different data types which take different amounts of memory. It then writes the entire EEPROM with values ranging from 0-255. It then goes back and reads out the data from the first 11 memory locations, one per second, while also reporting the current time and temperature. Notice that in bytes 0 – 6, there will be the Char, Int and Float data that we wrote at first so you can see what it looks like when read back out as bytes. Bytes 7 – 10 should contain the numbers that match their addresses 7 – 10. Once it goes through the first 11 EEPROM addresses, it writes 0’s to the entire EEPROM to erase it and then suspends execution. example program that is installed with the library. Once correct date/time info has been entered, comment this line back out. // Use following command only once to set current day/time, then disabled by commenting it back out.